The Friendlies Foundation is again holding a major Art Union and will be raffling off a new car. 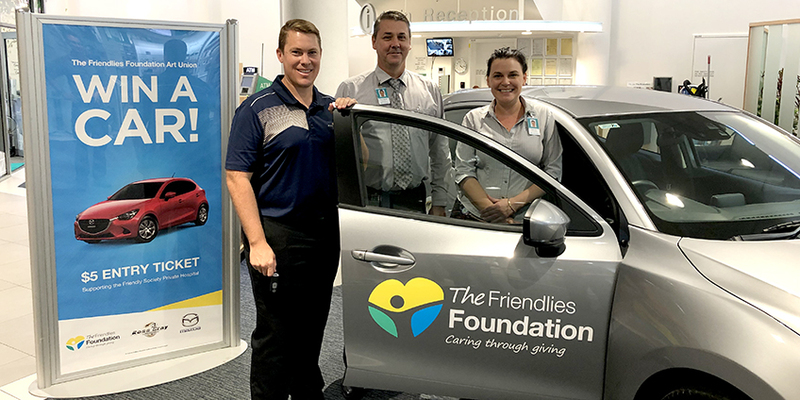 For the third year, The Friendlies Foundation has partnered with Ross Gray Mazda and Mazda Australia to raffle a Silver 2019 Mazda 2 Neo, four-door hatch, including on-road costs, valued at $20,494. The Friendlies Foundation Public Relations Officer Tunja Cottier thanks Ross Gray Mazda for their support once again. “It is great to be able to partner with a local business in what is one of our major fundraisers for the year,” Ms Cottier said. “Last year we raised $11,000 through our Art Union, which was a fantastic effort and a wonderful boost to the foundation. Ms Cottier said the tickets would be available at the Friendly Society Private Hospital and Friendly Society Pharmacy. “We have a team of volunteers from Wide Bay Volunteers who will be helping us again this year to sell the tickets, which we are extremely grateful to,” Ms Cottier said. “Tickets can also be purchased over the phone with a credit card by calling 4331 1024. We also have Eftpos facilities available for people to purchase tickets. “If there are any businesses that would be happy to support The Friendlies Foundation by selling tickets for us, we would welcome their call on 4331 1024. Tickets are available now, with the winner drawn on Friday, September 13. For terms and conditions, click here.